At Saponara Brain and Spine, we take your health seriously, and Cluster Headaches (CH) can seriously affect your life. These types of headaches are one of the most painful and usually affect those over the age of 30. They can occur during the day, but they also can occur in the evening preventing sleep. 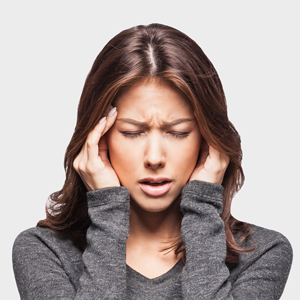 How are cluster headaches different from regular headaches or migraines? How can you prevent and treat cluster headaches? Let’s walk through the symptoms and what can be done to relieve your pain. They generally occur on one side, with the right being predominate, and can last 15minutes to 3 hours. A prodrome may exist with patients exhibiting the following before a (CH) occurs: blurred vision, nausea, hunger, irritability, sensitivity to smell, tiredness, body numbness, neck pain, and at times an aura. Some triggers can be alcohol consumption, heat, sleep apnea, and exercise. Cluster headache symptoms can include more than one of the following: agitation, restlessness, facial numbness, arm ataxia, ptosis, eye lid edema, facial/forehead sweating, pain radiating to the teeth, jaw, neck and cheeks, lacrimation, photo/phonophobia, lacrimation, and gait ataxia. This form of headache can be episodic, or chronic, with 15 or more occurrences over a 3 month period. Where Do Cluster Headaches Come From? There can be multiple causes of (CH), with the most common being hereditary, a result from a previous head trauma, insufficiencies of the Trigeminal system, or combinations of the above. Whatever the cause, if you’re feeling significant pain and discomfort it’s important to check in with a functional neurologist to get evaluated. When it comes to treatments, those with (CH) know it’s hit or miss, with some treatments being highly invasive. At Saponara Brain and Spine, our success rate treating (CH) through Functional Neurology is extremely high, with the majority of symptoms completely resolving. That’s because we improve the function of targeted pathways specifically in the brain causing the (CH), by repairing the existing pathways or creating new pathways to improve function of the nervous system, through neuro-plasticity. This is not clear cut, everyones case presentation differs, because there are no two brains exactly alike. Many times there are multiple systems involved with these types of headaches. With that said, Saponara Brain and Spine has a high success rate treating (CH), and a majority of Trigeminal nerve based conditions with reoccurrence being minimal, if any at all.